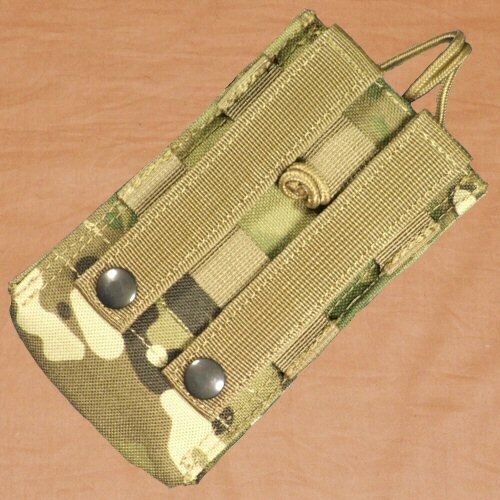 A tall open radio pouch which is designed to fit the PRC148 MBITR radio or similar. The pouch has an internal velcro adjustment for the height of the radio which allows the radio to be stored in a position which permits easy access to the radio display and buttons if required. The communications unit is retained over the top via a double loop of cord attached to a quick release buckle which is unclipped from the front. This allows easy access to the controls and connections on the top of the unit. The cord is attached to the pouch, and can be easily renewed or replaced with a longer cord if necessary. Pouch dimensions are 14.5x89x3.5cm. 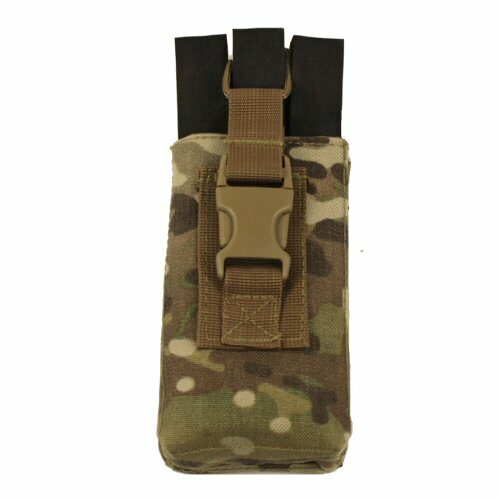 The pouch is retained via two button down MOLLE webbing straps which can be interwoven between the carrying base and the pouch for added stability and security. The pouch is made from 1000D Milspec Cordura with Cordura webbing straps, and is double stitched for durability. Rear view of the pouch, showing the strapping for mounting the pouch to the base and the elastic shock cord which is drawn through and knotted in the rear. This allows for further adjustment for the height of the radio to be inserted.